We present details of the homo-epitaxial growth of Yb:YAG onto a <100> oriented YAG substrate by pulsed laser deposition. Material characterization and initial laser experiments are also reported, including the demonstration of laser action from the 15 µm-thick planar waveguide generating 11.5 W of output power with a slope efficiency of 48%. This work indicates that under appropriate conditions, high-quality single-crystal Yb:YAG growth via pulsed laser deposition is achievable with characteristics comparable to those obtained via conventional crystal growth techniques. J. I. Mackenzie, “Dielectric solid-state planar waveguide lasers: A review,” IEEE J. Sel. Top. Quantum Electron. 13(3), 626–637 (2007). S. J. Beecher, T. L. Parsonage, J. I. Mackenzie, K. A. Sloyan, J. A. Grant-Jacob, and R. W. Eason, “Diode-end-pumped 1.2 W Yb:Y₂O₃ planar waveguide laser,” Opt. Express 22(18), 22056–22061 (2014). D. P. Shepherd, S. J. Hettrick, C. Li, J. I. Mackenzie, R. J. Beach, S. C. Mitchell, and H. E. Meissner, “High-power planar dielectric waveguide lasers,” J. Phys. D Appl. Phys. 34(16), 2420–2432 (2001). H. Baker, J. Lee, and D. Hall, “Self-imaging and high-beam-quality operation in multi-mode planar waveguide optical amplifiers,” Opt. Express 10(6), 297–302 (2002). M. J. F. Digonnet and C. J. Gaeta, “Theoretical analysis of optical fiber laser amplifiers and oscillators,” Appl. Opt. 24(3), 333–342 (1985). J. I. Mackenzie, J. W. Szela, S. J. Beecher, T. L. Parsonage, R. W. Eason, and D. P. Shepherd, “Crystal Planar Waveguides, a Power Scaling Architecture for Low-Gain Transitions,” IEEE J. Sel. Top. Quantum Electron. 21(1), 380–389 (2015). C. Grivas, T. C. May-Smith, D. P. Shepherd, and R. W. Eason, “Laser operation of a low loss (0.1 dB/cm) Nd:Gd3Ga5O12 thick (40 μm) planar waveguide grown by pulsed laser deposition,” Opt. Commun. 229(1-6), 355–361 (2004). T. C. May-Smith, J. Wang, J. I. Mackenzie, D. P. Shepherd, and R. W. Eason, “Diode-pumped garnet crystal waveguide structures fabricated by pulsed laser deposition,” 2006 Conf. Lasers Electro-Optics 2006 Quantum Electron. Laser Sci. Conf. (2006). S. H. Waeselmann, S. Heinrich, C. Kraenkel, and G. Huber, “Lasing in Nd3+-doped Sapphire,” in Advanced Solid State Lasers, OSA Technical Digest (online) (Optical Society of America, 2015), p. ATu1A.6. J. Lancok, M. Jelinek, and F. Flory, “Optical properties of PLD-created Nd:YAG and Nd:YAP planar waveguide thin films,” in (1999), Vol. 3571, pp. 364–367. M. Jelinek, J. Oswalda, V. Studnikaa, J. Lancok, M. Paveka, D. Chvostova, V. Slechtováa, K. Nejezchlebb, and A. Mackovác, “Optical properties of Er : YAG and Er : YAP materials and layers grown by laser,” 5036, 268–274 (2003). M. Ezaki, M. Obara, H. Kumagai, and K. Toyoda, “Characterization of Nd:Y3Al5O12 thin films grown on various substrates by pulsed laser deposition,” Appl. Phys. Lett. 69(20), 2977 (1996). T. Shimoda, Y. Ishida, K. Adachi, and M. Obara, “Fabrication of highly ytterbium (Yb3+)-doped YAG thin film by pulsed laser deposition,” Opt. Commun. 194(1-3), 175–179 (2001). T. C. May-Smith, A. C. Muir, M. S. B. Darby, and R. W. Eason, “Design and performance of a ZnSe tetra-prism for homogeneous substrate heating using a CO2 laser for pulsed laser deposition experiments,” Appl. Opt. 47(11), 1767–1780 (2008). T. C. May-Smith, C. Grivas, D. P. Shepherd, R. W. Eason, and M. J. F. Healy, “Thick film growth of high optical quality low loss (0.1dBcm−1) Nd:Gd3Ga5O12 on Y3Al5O12 by pulsed laser deposition,” Appl. Surf. Sci. 223(4), 361–371 (2004). “Inorganic Crystal Structure Database (ICSD),” http://icsd.cds.rsc.org . 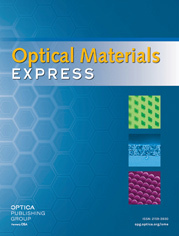 K. A. Sloyan, “Multi-beam pulsed laser deposition for engineered crystal films,” PhD Thesis, University of Southampton (2012). F. D. Patel, E. C. Honea, J. Speth, S. A. Payne, R. Hutcheson, and R. Equall, “Laser demonstration of Yb3Al5O12 (YbAG) and materials properties of highly doped Yb:YAG,” IEEE J. Quantum Electron. 37(1), 135–144 (2001). B. Aull and H. Jenssen, “Vibronic interactions in Nd:YAG resulting in nonreciprocity of absorption and stimulated emission cross sections,” IEEE J. Quantum Electron. 18(5), 925–930 (1982). W. F. Krupke, “Ytterbium solid-state lasers - the first decade,” IEEE J. Sel. Top. Quantum Electron. 6(6), 1287–1296 (2000). Fig. 1 Schematic of pulsed laser deposition set-up. Fig. 2 XRD spectrum of (a) Yb(1.4%):YAG film, 2θ of 10° to 80°. (b) Yb(1.4%):YAG film (green) and blank YAG substrate (red), 2θ of 29° to 30°. Fig. 3 XRD data of the Yb(1.4%):YAG film on <100> YAG displayed as an intensity profile at α = 0 o of a (400) pole figure with <100> orientation. Fig. 4 Calculated absorption and emission cross sections from spectroscopic measurements of Czochralski- and PLD-grown Yb(1.4%):YAG. Fig. 5 Laser output performance as a function of pump power using a 50% output coupler. Inset: Image of the waveguide laser mode.